Italy has the highest level of faunal biodiversity in Europe, with over 57,000 species recorded, representing more than a third of all European fauna. This is due to various factors. The Italian peninsula is in the center of the Mediterranean Sea, forming a corridor between central Europe and North Africa, and has 8,000 km of coastline. Italy also receives species from the Balkans, Eurasia, the Middle East. Italy's varied geological structure, including the Alps and the Apennines, Central Italian woodlands, and Southern Italian Garigue and Maquis shrubland, also contribute to high climate and habitat diversity. Portions of Italy are included in the Mediterranean Basin biodiversity hotspot. Important terrestrial ecoregions include the Illyrian deciduous forests, the Italian sclerophyllous and semi-deciduous forests, the South Apennine mixed montane forests, the Tyrrhenian-Adriatic sclerophyllous and mixed forests, Apennine deciduous montane forests, the Dinaric Mountains mixed forests (Trieste) and the Po Basin mixed forests. There are also many cave systems significant for biodiversity. The Checklist of the Species of the Italian Fauna includes 4,777 endemic animal species in Italy. Unique mammals include the Corsican hare, the Sardinian long-eared bat, the Apennine shrew, the Udine shrew the Calabria pine vole and the Sardinian deer. Endemic amphibians and reptiles include the spectacled salamander, the Sardinian cave salamander, the Italian cave salamander, the Monte Albo cave salamander, the Sardinian brook newt, the Italian newt, the Italian frog, the Apennine yellow-bellied toad, the Sicilian green toad, the Aeolian wall lizard, the Sicilian wall lizard, the Italian Aesculapian snake, and the Sicilian pond turtle (Emys trinacris). Endemic fish include the Bergatino loach, the Italian barbel, the brook chub, the Arno goby, the Garda carp, the carpione del Fibreno, and the Timavo sculpin. There are almost 200 endemic species of lepidopterans in Italy. A notable species is the European owl moth found only in Southern Italy. There are 102 mammal species in Italy. Some of the species are Alpine Marmot, forest dormouse, Etruscan shrew (the smallest mammal in the world), European snow vole, and Schreiber's long-fingered bat. Notable large mammals are the Eurasian lynx, Italian wolf, Marsican brown bear, Pyrenean chamois, Alpine ibex, common genet, axis deer, mouflon, rough-toothed dolphin, crested porcupine and Mediterranean monk seal. Italy has recorded 516 bird species. Notable birds are the hoopoe, roller, white-backed woodpecker, black woodpecker, European green woodpecker, Alpine chough, snow finch, rock partridge, Bonelli's eagle, goshawk, eagle owl, lammergeier, Egyptian vulture, griffon vulture, collared pratincole, glossy ibis, spoonbill, Allen's gallinule, great bustard, trumpeter finch, rosy starling, great spotted cuckoo, woodchat shrike, bluethroat and Eurasian nightjar. Italy is an important route for trans-Saharan bird migrants because it is a natural bridge connecting continental Europe to Africa across the Mediterranean. Migratory birds with a low wing loading such as stork, European honey buzzard, black kite, marsh harrier, kestrel and hobby depend on thermals and updrafts for soaring to cross the Mediterranean in spring. Although the majority of these birds enter Europe via the Bosphorus or Straits of Gibraltar large numbers leave at Cap Bon in Tunisia and enter Europe via the Aeolian Islands and the Straits of Messina to Calabria. Most of these birds breed in central and northern Europe. The birds return to Africa in autumn by the same route. The Italian fauna includes 56,213 species of invertebrates. This is 97.8% of the total species richness (the vertebrates are 2.2%). Of these 37,303 species (approximately 65%) are insects. The (recorded) species richness of the Italian fauna is certainly one of the highest in a European country. For insects (the best known in other countries as well and therefore allowing comparison) the species richness is the absolute highest (Minelli A., 1996). Northern Italy (Friuli Venezia Giulia, Veneto, Trentino-Alto Adige, Lombardia, Val d'Aosta, Piemonte, Liguria, Emilia-Romagna) has 33,414 invertebrate species. Peninsular Italy (Toscana, Marche, Umbria, Lazio, Abruzzi, Molise, Campania, Puglia, Basilicata) has 24,297. This may be a faunistic gradient but less complete data are available for southern Italy and the biotopes are very different. ( Stoch F., 2004). 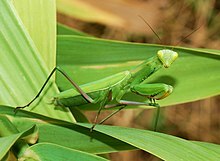 Commonly seen insects in Italy are the sail swallowtail, the scarlet dragonfly, Cleopatra butterfly, European praying mantis, cicada, glow-worm, hummingbird hawk-moth, Italian stinkbug, firebug, field cricket, European hornet, cuckoo wasp, carpenter bee and the rose chafer. Characteristic habitat types of the Italian Mediterranean coastal zone are the Cystoseira biocenosis and the Posidonia oceanica seagrass beds, Lithophyllum lichenoides communities form coralligenous reefs which are a spectacular sight the coralline alga is covered with large gorgonian fans, coral, and a diverse array of often colorful invertebrate organisms and hundreds of species of fish. These communities host sponges (Porifera), sea anemones and jellyfish (Cnidaria), sea mats and hornwrack (Bryozoa), segmented worms (Annelida), snails, bivalves, squids and octopuses (Mollusca), starfish and sea urchins (Echinodermata), crabs, lobsters and shrimps (Crustacea), and little known groups such as Echiura, Priapulida, Sipuncula, Brachiopoda, Pogonophora, Phoronida and Hemichordata. Amongst the thousand or so species of invertebrates found in the Italian marine environment are Squilla mantis, Mediterranean slipper lobsters, common octopus, common cuttlefish, scribbled nudibranch, Hypselodoris picta, tasselled nudibranch, Flabellina affinis, precious coral, zigzag coral, purple sail, Mediterranean jellyfish, spiny spider crab, circular crab, broad-clawed porcelain crab, noble pen shell, pilgrim’s scallop, ragged sea hare, violet sea hare, Portuguese man o' war, black sea-urchin, purple sea urchin, Mediterranean starfish, sea mouse, and Parazoanthus axinellae. The Tyrrhenian and Ionian meet in Straits of Messina generating powerful currents and strong turbulence, aggravated by the abrupt changes of sea bottom topography in the vicinity of the town of Messina. As a consequence many species, known as rare in the Mediterranean are found in large numbers in the straits. It is common to find deep species at the surface and vice versa, or open-sea species along the coast. The upwelling water drags abyssal species to the surface and sometimes strands them on the shore. Made famous in the nineteenth century by the zoologists Nicholas Miklouho-Maclay and Anton Dohrn, the straits have an extraordinary abundance and structure of planktonic, benthic and nektonic communities. Two monk parakeets; this species is now harmlessly established in urban parks. The Italian fauna is rich in introduced species. Many introductions date from the time of the Roman Empire, such as the common carp. Examples of more recent—and sometimes unwelcome—arrivals are the Asian tiger mosquito from Southeast Asia, the citrus long-horned beetle from China, the citrus pest cottony cushion scale, the pumpkinseed fish, the mosquitofish, the Louisiana crayfish, the zebra mussel, the strawberry finch, the Eastern grey squirrel, Finlayson's squirrel and the coypu. Two introduced parrot species, the monk parakeet and the rose-ringed parakeet, are found in city parks. Since the construction of the Suez Canal in 1869, invasive marine species originating from the Red Sea have become a major component of the Mediterranean ecosystem. Known as the Lessepsian migration, the introduced species have caused serious impacts on the Mediterranean ecology, endangering many local and endemic Mediterranean species. About 300 species native to the Red Sea have already been identified in the Mediterranean Sea, and there are probably others yet unidentified. Italy has 20 National Parks and more than 130 Regional. In addition, there are National Reserve areas (some 150 territories protected by state laws), Regional Reserves (a total of 270 areas protected by regional laws), and 16 Marine Reserves. ^ "ITALY'S FIFTH NATIONAL REPORT TO THE CONVENTION ON BIOLOGICAL DIVERSITY" (PDF). Italian Ministry for the Environment, Land and Sea. Retrieved 17 May 2015. Minelli A., Ruffo S., La Posta S. (Eds), 1993-1995Checklist delle specie della Fauna d'Italia [Checklist of the species of the Italian Fauna] Calderini Ed., Bologna. The first complete inventory of the animal species of a whole country in Europe.Records 57,422 species (56,168 invertebrates and 1,254 vertebrates). A collaboration between Nature Conservation Service and the Scientific Committee for the Fauna of Italy, Italian Zoological Union and the National Academy of Entomology. 272 specialists from 15 countries were involved in the project.Species are (uniquely) identified by numerical codes. The work is divided into 110 issues. Minelli A., 1996 La checklist delle specie della fauna italiana. Un bilancio del progetto. Bollettino Museo Civico Storia naturale Verona, 20: 249-261. Minelli A, Chemin, C., R. Winch & Ruffo S. Ruffo & S.2002 La fauna in Italia. The fauna in Italy. Touring Editore, Milano e Ministero dell'Ambiente e della Tutela del Territorio, Roma. Touring Editore, Milan and Ministry for the Environment and Territory, Rome. 448 pp. Sindaco, R., Doria, G., Razzetti, E. and Bernini, F. 2006 (eds) Atlas of Italian Amphibians and Reptiles\Atlante Degli Anfibi E Dei Rettili D'Italia Polistampa. Logozzo, D., Bassi, E., and Cocchi, L.. 2004. Crossing the sea en route to Africa: autumn migration of some Accipitriformes over two central Mediterranean Islands. Ring 26:71-78. Stoche, F., 2000 How many endemic species ? Species richness assessment and conservation priorities in Italy.Belgian Journal of Entomology, 2: 125-133. Stoche, F., 2004 Banche dati e distribuzione della fauna italiana: gli invertebrati. Quad. Cons. Natura, 18, Min. Ambiente Ist. Naz. Fauna Selvatica: 21-36. This page was last edited on 17 April 2019, at 20:30 (UTC).